The role of endothelin-1 (ET-1) and its receptors (ET-RA and ET-RB) in tumour development and progression involves complex interactions. ET-1, produced by tumours and associated cells like endothelial cells, functions in an autocrine and paracrine manner to promote tumour angiogenesis. Thus, we hypothesised that endothelin, released into the tumour milieu by both tumours and the tumour vasculature, would influence angiogenesis. Therefore, this preliminary study aimed to investigate changes in ET1, ET-RA and ET-RB in breast tumour and microvascular endothelial cultures when each cell type was exposed directly to the other (co-culture model) as well as to the conditioned-medium metabolites of the other (challenge model). ET-1 secretion was measured by an enzyme-linked immunosorbent assay and ET-1, ET-RA and ET-RB expression investigated by the linked streptavidin-biotin method. 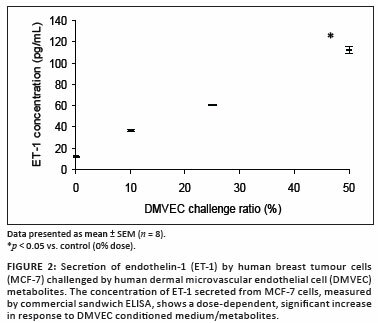 In challenge experiments, endothelial metabolites significantly increased secretion of breast tumour ET-1. Tumour metabolites promoted endothelial membrane projections with no effect on ET-1 secretion. ET-1 and its receptors were immunolocalised in both cell types, including in projections. Increasing cancer cell conditioned medium resulted in decreased endothelial ET-RA and increased ET-RB staining. Co-cultures demonstrated ET proteins in projections of both cell types as well as at heterogeneous contact points. The findings support a role for the endothelin system in endothelial cell and breast cancer cell invasion. It is tempting to consider that early endothelial and tumour cell alterations may be promoted by ET-1 produced by both cell types. Further work is required that will examine localised cellular gene expression of the endothelin system as well as its pro-invasive and angiogenic effects in breast cancer models. The overall contribution of the ET system to tumour angiogenesis, as well as to tumour spread and development, is a result of complex interactions as ET is both produced by, and influences the vasculature and the tumour cells. Therefore, we set up a preliminary study to further explore the inter-relationship between the ET system, endothelial cells and breast tumour cells using two models that mimic the complicated in vivo micro-environment. We investigated the endothelin system when two cell types, namely human dermal microvascular endothelial cells (DMVEC) and the human breast tumour cell line (MCF-7) were cultured together and when each was exposed to the metabolites/conditioned medium (CM) of the other. The aim in this pilot phase was to determine the induction of the endothelin system in heterogeneous cell culture models by measuring protein synthesis, sequestration and the subsequent effects following release. The project was approved by the Biomedical Research Ethics Committee, University of KwaZulu-Natal (Reference H074/06). Human dermal microvascular endothelial cells (DMVECs) were purchased from Cambrex BioScience (New Jersey, USA) and MCF-7 cells were obtained from Highveld Biological, National Repository for Biological Material of the Cancer Association of South Africa (Johannesburg, South Africa). The DMVECs were maintained in supplier-specified endothelial growth medium (EGM®-2 MV; Cambrex BioScience) and the MCF-7 cells in supplemented Eagles Minimum Essential Medium (EMEM; Cambrex BioScience), both with 10% foetal calf serum at 37 ºC/5% CO2. Tumour medium was supplemented further as previously described.11 Only DMVECs between passages 4 and 12 were used for the challenge and co-culture models. The challenge model was performed according to a previous method.11 Briefly, seeding densities of DMVECs and MCF-7 were 3 x 103 cells/cm2 and 3.5 x 103 cells/cm2, respectively. At approximately 60% confluency, CM was extracted from each line and added to the other cell line at concentrations of 10%, 25% and 50%. Thus metabolites were presented to proliferating cell lines in a dose-controlled manner. Following 24-h incubation, cell proliferation was measured by a formazan-reduction assay (MTT) and the spent media collected for ET-1 measurement by an enzyme-linked immunosorbent assay (ELISA). In an identical experiment, after challenging the cells, they were serum-cleared overnight at 37 ºC/5% CO2, fixed in ice-cold methanol for 20 min at -20 ºC and then immunostained for ET-1, ET-RA and ET-RB. The co-culture model has been previously described.11 Briefly, DMVECs were seeded onto 8-chamber glass slides (Iwaki Glass Co., Iwaki, Japan) at 2 x 103 cells/cm2. After 24 h, MCF-7 cells were added to each DMVEC chamber at 2 x 103 cells/cm2. Thereafter, the heterogeneous endothelial-tumour cell populations were left to interact for approximately 24 h at 37 ºC/5% CO2. Once cell interaction had been established with an inverted microscope (DMIL, Leica, Wetzlar, Germany), co-culture sets were serum-cleared and fixed as described for the challenge model above, and then immunostained for ET-1, ET-RA and ET-RB. Projections are membrane extensions emanating from the cell periphery, and, in the present context, were considered to be a function of cellular motility. To determine whether tumour CM influenced the number of membrane projections produced by the DMVECs, these projections were counted. In each field of view, archived as a 24-bit TIFF image, the number of visible projections was counted by two independent observers. Two fields of view for each of the four challenge ratios were evaluated. ET-1 concentration was measured using a commercial human ET-1 sandwich ELISA kit (Assay Designs, Ann Arbor, USA), as per supplier's instructions. The sensitivity range of the assay was between 0.14 pg/mL and 100 pg/mL. Controls consisted of assay buffer (blanks) and internal controls (fresh media). Two independent experiments were performed with duplicate standards and quadruplicate samples for each challenge ratio. The linked streptavidin-biotin (LSAB) method11 was used to immunolabel the control tissues and cultured cells for ET-1, ET-RA and ET-RB. Normal placental tissue was used for ET-1 and normal kidney tissue was used for both ET-RA and ET-RB detection. Briefly, fixed DMVEC and MCF-7 cells were processed and incubated with their respective polyclonal rabbit anti-human ET-1, ET-RA and ET-RB IgG at the following dilutions, respectively: (1) DMVECs at 1:150, 1:100 and 1:200; MCF-7 at 1:350, 1:100 and 1:300 and (2) tissues at 1:300, 1:300, 1:1000. Following this, as per manufacturer's instructions, an avidin-biotin kit (LSAB-2, Dako, Ely, UK) and substrate 3,3'-diaminobenzidine (DAB; Dako) was used to visualise staining. As a positive cell culture control, unchallenged DMVECs were also immunolabelled for the endothelial cell-specific protein, von Willebrand Factor (1:200, vWF; Dako). For the negative controls, for both tissues and cells, the primary antibody was substituted with milk blocker solution. The immunolabelled control tissues as well as the challenged and co-cultured cells were viewed under a bright-field, phase contrast microscope (DMLB; Leica) coupled to a digital camera (DFC 300FX; Leica) and results were captured as TIFF images and archived. For each challenge group, the AnalySIS ProTM 5 software12 was used to analyse cells (n = 8) for staining intensity (that is, concentration of protein). To quantify the immunostaining, the archived 24-bit TIFF images were converted to 8-bit binary images with a grey scale of 256 phases and for each region of interest the mean grey scale intensity value and the area were calculated. Non-specific background, calculated from immunostaining in method controls, was considered to be less than 120 pixels/µm2. Immunoreactive ET-1, ET-RA and ET-RB were all found in the peri-nuclear and cytoplasmic regions of DMVECs and were particularly marked in cell projections (Figure 1a, 1c and 1e). Further, on visual (qualitative) examination, there appeared to be no change in the intensity of immunostaining of any of these three target proteins with increasing concentrations of CM. However, when quantified using image-analysis software, there was a small but significant decrease in the intensity of ET-RA staining (p = 0.05), while, in contrast, the intensity of staining of ET-RB increased by a maximum of 36% (0% to 25% CM, p < 0.01 and 10% to 25% CM, p < 0.01) (graphs not shown). There were no significant changes in the intensity of ET-1 staining in DMVECs as the concentration of MCF-7 CM increased. Further, no appreciable change in secretion of ET-1 was detected in response to increasing concentrations of CM (not shown). The baseline concentration of ET-1 secreted from DMVECs was 92.3 pg/mL ± 1.5 pg/mL (not shown). The number of membrane projections on DMVECs, per field of view, increased with increasing concentrations of MCF-7 CM and, on average, there were increases of 76% and 46% at 10% and 50% challenge ratios, respectively, when compared to baseline. Although mean baseline secretion of ET-1 from the MCF-7 cells was only 11.6 pg/mL ± 0.2 pg/mL, ET-1 secretion, in response to increasing concentrations of DMVEC CM (p < 0.01), increased significantly with an approximate 11-fold increase at the 50% challenge (112 pg/mL ± 3.3 pg/mL) (Figure 2). While ET-1, ET-RA and ET-RB were found in the MCF-7 cells (Figures 1b, 1d and 1f), especially in projections (not shown), there were no appreciable changes in the intensity of staining (quantitative) with increasing concentrations of DMVEC CM (graphs not shown). When co-cultured, both DMVECs and tumour cells demonstrated ET-1, ET-RA and ET-RB staining, especially at heterogeneous points of contact and in tumour cell projections (Figures 1g and 1h). Immunolabelling showed that ET-1, ET-RA and ET-RB were expressed in both cultured DMVECs and MCF-7 cells. Components of the ET system have previously been reported in endothelial cells including those lining tumour-feeding vessels in ovarian carcinomas.4 In our study, ET-1 and its receptors were found in DMVEC projections. In the co-culture model (which allowed not only exposure of each cell line to the metabolites of the other but also direct cell to cell contact), projections from tumour cells and DMVECs were observed extending towards each other. Because ET-1 and its receptors were co-localised in projections of both cell types, ET-1 may have played a chemotactic role in promoting these effects, which are consistent with early cell invasion and migration. A role for ET in migration and invasion of endothelial cells in tumour angiogenesis has been previously proposed3,5 and we found that increasing concentrations of MCF-7 metabolites caused a marked increase in the number of projections on DMVECs. This finding is consistent with previous work that showed that CM from an ovarian carcinoma cell line increased endothelial cell migration.4 Those authors also found that the angiogenic response was reduced by 76% if the CM was co-incubated with VEGF antibody and an ET-RB antagonist, indicating that VEGF and ET-RB receptors were important in migration. In our experiments with MCF-7 CM, there was increased intensity of staining of ET-RB receptors in DMVECs as the concentration of tumour metabolites increased up to 25%. ET is considered to play a role in endothelial cell proliferation, and increased proliferation has been reported upon exposure to CM from human breast cancer cells.3,14 While we have also previously shown that MCF-7 CM increases DMVEC proliferation,11 the present study found that MCF-7 CM did not induce DMVECs to secrete more ET-1 into the surrounding medium, nor did it cause a significant change in intensity of immunostaining of ET-1 in DMVECs. Thus it appears that any changes observed in DMVECs, as a result of MCF-7 CM, were not brought about by changes in endothelial cell ET-1. However, it is now recognised that there is a complex interaction between ET-1, tumour cells and other associated cells, such that various cell types not only both produce and are affected by ET, but also influence one another's production of ET.15 Co-culture of tumour cells with macrophages, for example, leads to increased ET production.15 Of particular interest in our study was the finding that ET-1 production by MCF-7 increased progressively and significantly when these cells were exposed to increasing amounts of DMVEC metabolites. Considering the interplay between different cell types in the tumour environment, and the autocrine and paracrine effects of ET-1, we postulate that DMVECs promote MCF-7 to produce more ET-1, which may then play a paracrine role on the endothelial cells. The results of our study are consistent with a role for ET-1 and its receptors in breast tumour and endothelial cell invasion. The findings lend support to both autocrine and paracrine roles for ET-1 and to the complex interactions which exist in the micro-environment in which vascular and tumour cells co-exist in such close proximity. Further development of this preliminary study will incorporate cellular gene expression by in situ real-time polymerase chain reaction, as well as chemotaxis and invasion assays. We thank the University of KwaZulu-Natal and the South African National Research Foundation for funding part(s) of this project.